The Ministry of Internal Affair (MIA) released the result of inspection around the case that happened on March 28th in Batumi between the co-worker of Georgia’s Young Lawyers Association (GYLA), Roin Phartenadze and the Head of the Adjara main division of internal affairs, Valeri Telia. Surveillance cameras recorded the incident and one of the records was immediately published by MIA. However, GYLA reported that another video, where the incident was shown with a close-up was damaged. GYLA’s representatives assumed that this material was destroyed intentionally to hide the erroneous actions of the MIA officer. Meanwhile, the investigation result reads that one of the police officers wanted to take out the record, but “with negligence”, could not do it and damaged the video, the restoration of which was impossible. Also it is written in the statement that disciplinary punishment was raised against the police officer for damaging the video. 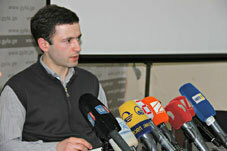 The Minister of Internal Affairs, Irakli Gharibashvili, said the incident between the two sides was exaggerated. Gharibashvili stated that the incident has been resolved and the Ministry continues its cooperation with the GYLA, adding that their work will be transparent and the information - available. Kozhoradze thinks that there are a lot of questions to be answered. “Why exactly was the material which showed better what actually happened was damaged?” Kozhoradze wonders. GYLA's head also stated that even in the video material published by the MIA, it reveals that Telia violated the law by getting into a confrontation with a citizen. Kozhoradze stated that the GYLA will introduce the details of the incident in Batumi and the result of the inspection to foreign organizations. “Our response is not yet finished,” Kozhoradze said. GYLA representatives also doubted whether Telia possesses a valid driving license or not. They asked the MIA for the information and are waiting for the official response on April 4th.